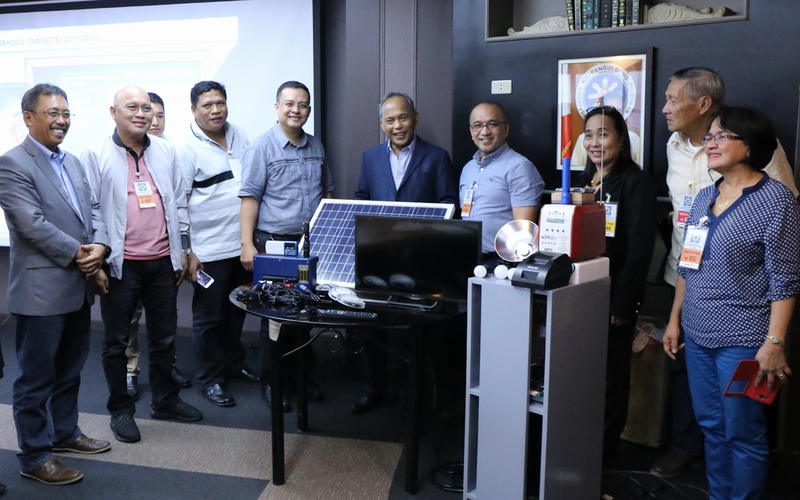 LIGHT THE FAR-FLUNG VILLAGES: Department of Energy Secretary Alfonso G. Cusi (center) signed the P131M worth memorandum of agreement that will energize far-flung areas with a prepaid solar home system at the DOE headquarters in Taguig City on Wednesday (Sept. 20, 2017). With Cusi are (from left) Electric Power Industry Management Bureau Officer-in-Charge Director Mario Marasigan; Bohol II Electric Cooperative General Manager Eugenio Tan, Board President Dionesio Oliavar Jr. and Institutional Services Department Manager Tito Andamon; DOE Usec. Felix William Fuentebella, Quezon II Electric Cooperative (QUEZELCO II) General Manager Victor Cada; Busuanga Island Electric Cooperative General Manager Ruth Galang and Board Pres. Francisco Espina; and QUEZELCO II Board President Normelita Curioso. To help speed up the household electrification of far-flung off-grid areas, Energy Secretary Alfonso G. Cusi signed last Wednesday (Sept. 20) a Memorandum of Agreement worth P131 million to energize 5,574 households in communities under Busuanga Island Electric Cooperative (BISELCO), Quezon II Electric Cooperative (QUEZELCO II) and Bohol II Electric Cooperative (BOHECO II). This forms part of the Philippine government counterpart for the European Union-Access to Sustainable Energy Program (EU-ASEP) program. The project involves the installation of a prepaid Photovoltaic Mainstreaming system for the 5,574 beneficiaries for 2017. The teams from European Union-ASEP and the World Bank, for their part, target the energization of 40,500 households between 2017 (10,000 HHs) and 2018 (30,500 HHs). “I want to fast-track the electrification projects, so that our kababayans in the far away communities can have access to basic energy services. We want the beneficiaries to have a decent life, their children to have the opportunity to read their books at night and the families to listen to the news and other developments among their other concerns,” Cusi said. The Secretary also urged the electric cooperatives to ensure the proper implementation of the project, specially on the identification of beneficiaries. "We have to make sure that we are delivering our services to the people, to their homes. Let’s be accountable and work hard together,” he said. • BISELCO: A total of 3,711 households residing in barangays Banuang Daan, Borac, Bintuan, Buenavista, Bulalacao, Cabugao, Lajala, Marcilla, Decabobo, Decalachao, Guadalupe, Malawig, San Jose, San Nicolas and Tara in Coron; Sto. Nino, Old Busuanga, New Busuanga, Quezon, Buluang and Panlaitan in Busuanga; and Culion Island. • BOHECO II: A total of 530 households living in barangays Cataban in Talibon; West Hingotanan, East Hingotanan, Bilangbilangan Dako and Bilangbilangan Diyot in Bien-Unido. • QUEZELCO II: A total of 1,333 households located in the barangays Aluyon in Burdeos; Canaway, Pagsangahan, Lumutan and Umiray in General Nakar; and Maunlad in Real. These beneficiaries are in the off-grid areas situated in isolated islets, households located or far from electrified sitios, and isolated areas such as small communities in upland areas. The DOE electrification program entails two solar home systems (SHS) Services - the SHS Service 1 with 30 watt peak and the SHS Service 2 with 50 watt peak. These systems could power lighting systems, charge mobile phones and run small television sets. Based on the Energy Regulatory Commission solar home system (SHS) electricity service rate for electric cooperatives, the beneficiaries will pay between P180.00 - P222.00 per month or P5-P8 per day, depending on the solar home system and zoning service or distance from the electric cooperative headquarters. “For sustainability, the electric coops will impose service charges to recover the costs of maintaining and replacing certain components of the system. There will also be a technician to check and monitor the systems,” the Energy Chief said. Together with the Secretary, the signing ceremony was also attended by DOE Usec. Felix William B. Fuentebella, OIC for Electric Power Industry Management Bureau (EPIMB) Director Mario C. Marasigan, OIC for EPIMB-Rural Electrification Administration and Management OIC Division Chief Engr. Josue B. Balacuit, DOE Legal Services representative Atty. Isidro V. Almenteros, DOE Accounting head Arturo Cudia and officials of BISELCO (General Manager Ruth Galang and Board President Francisco Espina), BOHECO II (General Manager Eugenio Tan and Board President Dionesio Oliavar Jr.), and QUEZELCO II (General Manager Victor Cada and Board President Normelita Curioso).